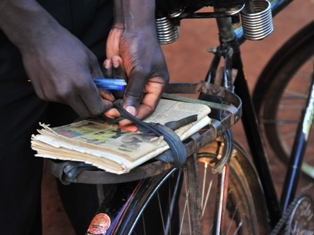 Students from Buzaya Secondary School in Uganda wrote essays about how they go to school. One of the students wrote that he cycles 9 miles to school every day, every morning he leaves when the sun rises with his books on the carrier. Before he had the bicycle he often arrived at school late, and had to sweep the school compound as punishment, missing out another hour of classes. 14 students won a second prize: a t-shirt, and 1 student wone the first prize: a brand new bicycle. The essays were reviewed by students of the Citadel College in Lent (the Netherlands), who organised a fundraising event for this CYCLE2SCHOOL project in Kisozi. For more information about this project, click here. No Comments to "Cycling to school in Kisozi"